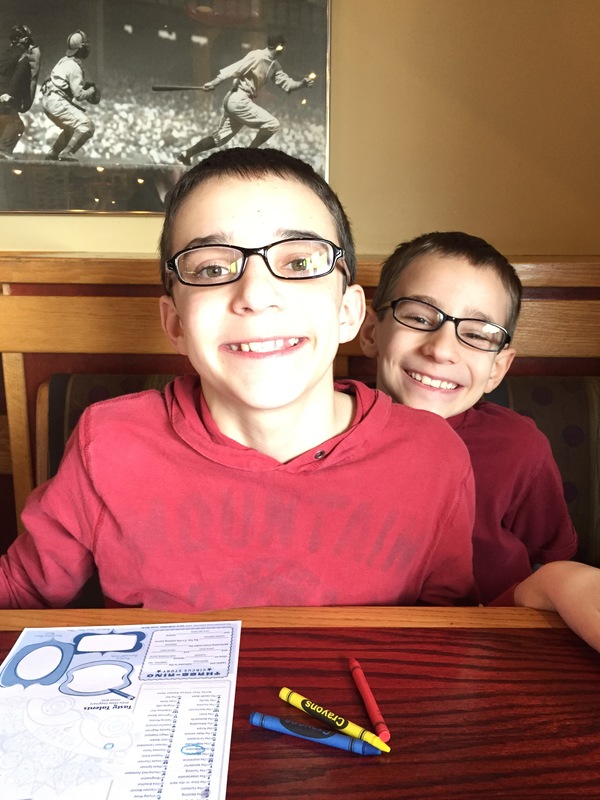 This week, I wanted to share a paragraph that my middle son (5th grade), reluctant writer extraordinaire, wrote about his older brother (my son with Asperger’s). I saved the best for last. Now you might think, “What does a picture have to do with anything”? (see below – brought in to teach his class about himself at the start of the school year). For one thing it’s not just a picture. It’s of my brother and I. My brother’s name is Liam and he is my role model. He’s smart, really creative, and likes every thing I like. Now I can write 20 pages on my brother Liam and what a great influence he is but, you’ll probably get just one. On major way my brother is a role model is he never lies unless he’s joking around. Another way he’s a role model is he’s very kind. That’s all about my amazing brother. We never expected the hike to take two hours each way that gained 1500 feet in elevation. It started flat enough. There was majestic scenery and the rushing sound of the river to entertain us. That was quickly taken over by narrow switchbacks. Kieran, the almost ten year old, started first, “Do we have to go all of the way up? This seems like far enough.” We usually are not this active. I had to take quite a few breaks – it is always tough to get started again after you stop for a bit. Hikers on the way down kept saying, “You’re only about half way there.” Or, “The first falls is not it. It’s about 45 minutes further on.” We kept going, kept encouraging each other. “It’ll be so great at the top.” “Just wait until we see it.” “Howers are not quitters.” When we made it, we were proud of our little family. Our son with Asperger Syndrome complained the least. That was something new. Our daughter did not complain at all, as usual. She is our athlete. The way down was actually the worst – very painful on the knees. Less anticipation of our reward at the top. We ate Mexican for lunch, at 1:30 p.m. – also very atypical of our family who usually eats at 11:30 a.m. The kids complained more about the Mexican than they did their sore muscles and thirst. Back at the cabin, we all soaked in the hot tub, around three in the afternoon. It was glorious. Then came the naps. Snuggling after such a big accomplishment felt wonderful. Movie, popcorn, and more snuggling after we woke up later that evening. This is what we came to do – have adventures and make memories. Checked both boxes well today. In “The Last Kiss,” Ralph Fletcher describes how his father initiates his son’s transition into manhood by ceasing their nighttime ritual: a kiss goodnight. “‘Well, good night, then,’ he said, giving me a kind of half-smile, half-sigh that was peculiar to him. I was stunned” (Fletcher, 2013, p. 29). “Next night I decided to try my father again. Maybe last night’s missed kiss was no more than a quirk…. ‘It’s bedtime,’ I murmured…. I merely watched with a sinking heart as my father’s hands got busy again, not with me but with something else, this time stacking his book samples in cardboard boxes. He stood up and turned to me. He reached forward to touch my arm. He squeezed my shoulder…. I was eight years old…. I was too old to be kissed by my father” (p. 30). “Can I come in to snuggle?” my ten year old son tentatively asked. He weighs down the mattress as he clambers excitedly into his “middle spot” – much heavier than he was when this ritual started four years ago. Before, the boys shared a room and giggled themselves to sleep nightly. I prayed on the top bunk, prayed on the bottom bunk. Then, turned out the light. Brothers, keeping each other company. When we moved, at first, our middle son came out with me to “the big house” alone – he was in first grade and eager to join me in our new town. His brother stayed back a few weeks to take the state test and leave third grade a little later. That’s when the snuggling started. Keeping each other company. When the rest of the family arrived, the house was so big that each child had their own room. The snuggling routine continued. No worries about this new habit. It would not last past fourth grade. We’ve known that time was running out. This precious time with my energetic, talkative, argumentative guy – our time to be calm, talk about our day with soft, relaxed voices, helping him settle down into sleep – was drawing to a close. Ten was too old to be snuggling in bed with a mama, wasn’t it? As he drifts off to sleep, quiet tears trickle down my face. My guy is growing up too fast. I am going to have to give up a time that I have needed and looked forward to – bonding with my guy; snuggling with my baby. Letting me hold him protectively in my arms. I am not ready to let him go. But ten year’s old is too old to snuggle – and like Ralph’s father, I will soon have to let him go.